BALTIMORE–(BUSINESS WIRE)–With the support and help of the Sidney Kimmel Comprehensive Cancer Center at Johns Hopkins, SanuLife Inc. launched its ROVIDIUM products on August 13th, at the anniversary celebration of the company held at the Johns Hopkins University School of Medicine in Baltimore, which was witnessed by Dr. Zhang, Founder of SanuLife, together with his partner Mr. Chunshui Liu, and many other distinguished guests. Dr. Bert Vogelstein, Laureate of 2013 Breakthrough Prize in Life Sciences, and Mr. Farzam Kamalabadi, CEO of the US Future Trends International Group sent their congratulatory messages. 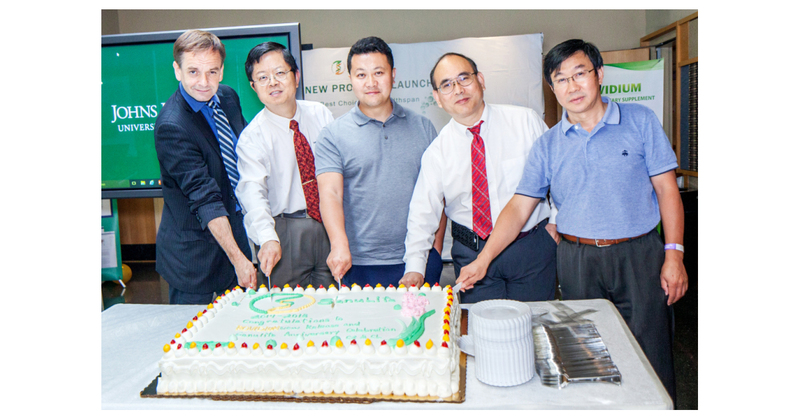 The event was also graced by Dr. Hans Spiegel, the Germany-and-US-trained MD, PhD physician-scientist with over 30 years of experience in the patient care, clinical and basic research, as well as many friends and colleagues of Dr. Zhang in Washington DC and on Johns Hopkins Hospital campus. ROVIDIUM, the result of Dr. Zhang’s 20-year anti-cancer and anti-aging research, promises safe, effective, and technically reliable production. By selecting high-purity anti-cancer small molecules from natural ingredients, the carefully formulated product enables continuous and efficient recovery of tumor suppressor gene expression that induces apoptosis of cancer cells. It can also slow down aging, reduce canceration and prolong healthy lifespan by enhancing the internal protection mechanism, down-regulating growth signal stimulation and inhibiting chronic inflammatory response in normal cells. “For researchers, nothing can be more exciting than launching new products. It spurs me and my team to conduct more innovative research and accelerate commercialization of achievements, so as to make more contribution to human health,” Zhang added. As the principal investigator of the Lung Cancer and Aging Project at Sidney Kimmel Comprehensive Cancer Center, Dr. Zhang has been engaged in cancer research for nearly 20 years. He has produced a host of internationally leading research results in such fields as “Clock of Life” telomere and telomerase, nuclear encoded mitochondrial longevity mutant protein, aging-associated chronic inflammation, obesity and cancer biomarker FAT10, immunoregulation factor gene expression and tissue localization, gene expression change during lung cancer progression, chemotherapy resistance and prognosis survival. His findings have been published in Cell, PNAS, Genomics, Cancer Research, Molecular Cancer Therapeutics and Nature, etc. Before meeting consumers, ROVIDIUM had been widely reported by media including the Associated Press, one of the four major international news agencies, and Yahoo, the mainstream US financial media. The anti-cancer and anti-aging ROVIDIUM gives play to the synergy between the tumor suppressor genes RhoB and p21 and the longevity transcriptional factor Nrf2, which drives expression of endogenous antioxidant, anti-inflammatory and anti-fibrotic genes. The product restores RhoB expression, which is continuously down-regulated by epigenetics during pulmonary aging, skeletal muscle decline, and tumorigenesis, and activates Nrf2 through p21 to stabilize the genome and protect cells from carcinogenesis, which aims to help delay aging, prevent cancer and increase longevity. The ROVIDIUM ingredients and raw materials are selected in a most strict manner. The core ingredients are rice germ and rice bran extract Ceramide, turmeric extract Curcumin and green tea extract EGCG, with raw materials meticulously selected from well-known suppliers of Japan, Germany, China and the US. The ingredients are evaluated by the US FDA as “Generally Recognized as Safe” (GRAS). Purified by high-tech and micro-encapsulated, ROVIDIUM features excellent purity, sustained-release stability and bioavailability. It’s produced and packaged by a selected Californian partner in accordance with the cGMP standard and above. As a responsible scientist, Dr. Zhang has entrusted a third party to conduct verification experiments on ROVIDIUM products. Preliminary results indicated that ROVIDIUM has tackled the bottleneck of low solubility of core ingredients, which proves to be highly water soluble. Validation experiments on A549 cells of non-small cell lung cancer prevalent in the US and China showed that ROVIDIUM core and luxury versions can dose-dependently induce the tumor suppressor gene RhoB and efficiently inhibit the Akt/mTOR signaling pathway which is critical in the process of canceration and aging, thus significantly inhibiting proliferation, metastasis and survival of A549 cells. Moreover, further validation experiments on Panc02 cells of the aggressive pancreatic cancer showed that ROVIDIUM killed malignant Panc02 cells even more than relatively well-differentiated A549 cells. As a dietary supplement, ROVIDIUM is not subject to preclinical or clinical trial requirements. Still SanuLife signed a cooperative agreement with HD Biosciences Inc. to carry out preclinical animal experiments for ROVIDIUM. Preparation is now under way for a first trial on the Panc02 syngeneic tumor models. Meanwhile, SanuLife has opened its official flagship store on the cross-border e-commerce platform XIJI.COM. Both core and luxury versions of ROVIDIUM are now available online.